I think Potluck foods should be easy to make, delicious, and easy to serve! People always ask if I bring cakes to holiday parties, BUT as much as I love cake I think a full cake is hard at parties. You need to have a knife to serve and a fork to eat it, SO I don’t bring cakes unless it’s specifically requested. 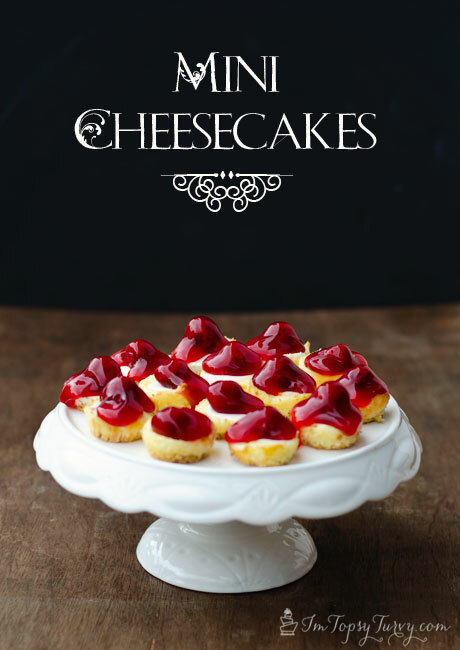 I think something already in serving portions, like these Mini Cheesecakes, are perfect! These are fast and easy to make, AND you can make them a few days before so you can get it done and not worry about them again (one less thing to put together the day of the event). Of course you don’t have to have a holiday party to make these, you can make them for your own family for fun! My kids love these little bite sized desserts! Beat the cream cheese and sugar until it's creamy and smooth. Add the egg yolks and mix until JUST incorporated. spoon batter into each cup. It isn't a ton, shake the pan a bit to help spread the batter JUST a bit. Bake for 15 mins, and pull out. While the cheesecakes are baking mix the sour cream, sugar and vanilla. Once you pull the cheesecakes out plop 1 tsp of the sour cream mixture on top of each cake. Place back in the overn and cook for 5 more mins. My husband isn’t a cheesecake fan, so when I cook an entire cheesecake I tend to be the only one eating it, and even I have a hard time with an entire cheesecake by myself! So the other thing I love to do with extra cheesecake is freeze them and dip them in chocolate, SERIOUSLY so good, I have an addiction to frozen cheesecake dipped in chocolate. And these little cheesecake bites are perfect to simply freeze and dip! Thanks! I think they are a pretty perfect dessert too! thank! They are really very good, even my husband, who isn’t a cheesecake fan loves these. 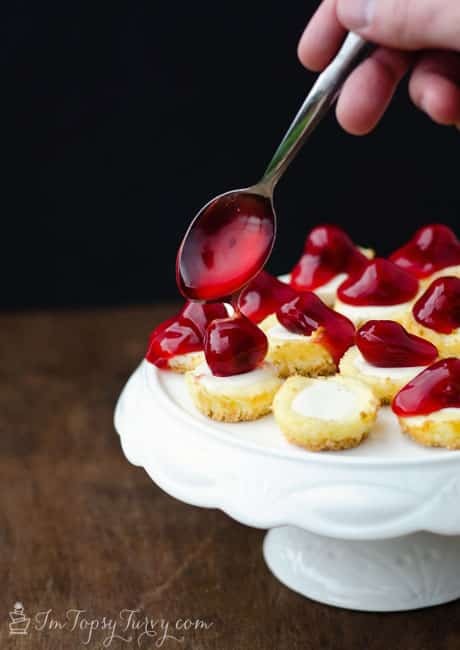 I think it’s the ratio of cherries to the small cheesecake bite! I make something similar! Yum! I can never stop at just one. I love the Cherry Pie Filling on top! Delicious! Nope, never, I think in the end you usually end up eatting as many of these little ones as you would just eating a normal slice! But somehow it SEEMS like less! Ashlee these look so good! 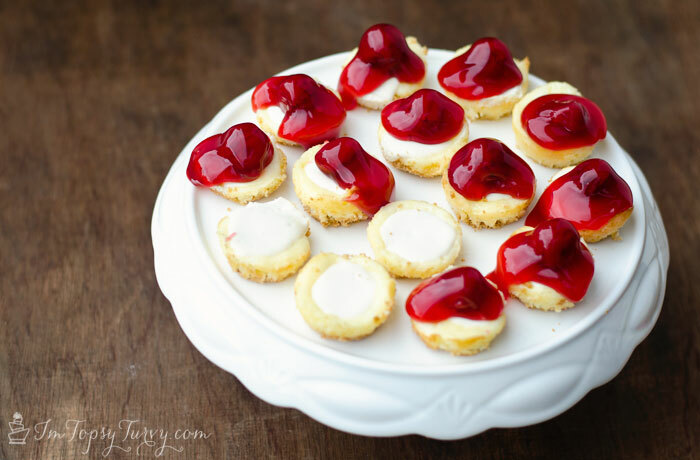 I just love cheescake and these are the perfect size for a potluck! thanks summer! I agree, I love finger foods at parties, so much easier to serve that way! I want to eat these right this minute! Mmmm me to, the kids and husband ate them all the second I finished my photo’s! I need to get invited to a holiday party to make some more! Thanks! I’ve been working on my photography all year, and I’m the most proud of this one! You should be – this is fabulous! Great job!! Thanks! now if I can just repeat it with my other pictures! Hello! Thanks for sharing your recipe. Did you water-bath the mini cheesecake? Did you use mini muffins pans ?